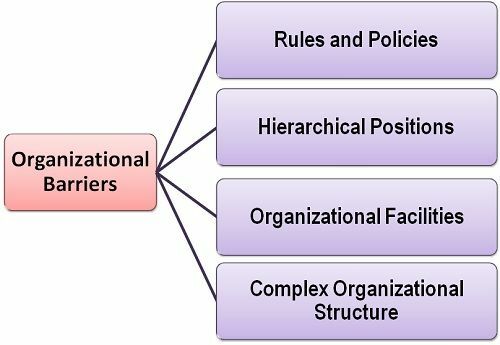 Definition: The Organizational Barriers refers to the hindrances in the flow of information among the employees that might result in a commercial failure of an organization. Organizational Rules and Policies: Often, organizations have the rule with respect to what message, medium, and mode of communication should be selected. And due to the stringent rules, the employees escape themselves from sending any message. Similarly, the organizational policy defines the relationship between the employees and the way they shall communicate with each other maintaining their levels of position in the organization. Such as, if the company policy is that all the communication should be done in writing, then even for a small message the medium used should be written. This leads to delay in the transmission of the message and hence the decision making gets delayed. Status or Hierarchical Positions in the Organization: In every organization, the employees are divided into several categories on the basis of their levels of the organization. The people occupying the upper echelons of the hierarchy are superior to the ones occupying the lower levels, and thus, the communication among them would be formal. This formal communication may often act as a barrier to the effective communication. Such as the lower level employee might be reluctant in sending a message to his superior because of a fear in his mind of sending the faulty or wrong message. Organizational Facilities: The organizational facilities mean the telephone, stationery, translator, etc., which is being provided to employees to facilitate the communication. When these facilities are adequately offered to the employees, then the communication is said to be timely, accurate and according to the need. Whereas, in the absence of such facilities, the communication may get adversely affected. Complex Organizational Structure: The communication gets affected if there are a greater number of management levels in the organization. With more levels, the communication gets delayed and might change before reaching the intended receiver. Thus, communication is the key factor in the success of any firm, and the communication is said to be effective when the employees interact with each other in such a way that it results in the overall improvement of the self as well as the organization.